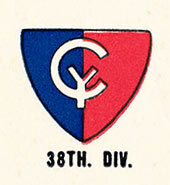 The 38th Infantry Division arrived in Hawaii on 17 January 1944. It received further training and the duty of the defense of Oahu. Elements trained in the Oro Bay area, New Guinea, from July to November; then moved to Leyte in December. 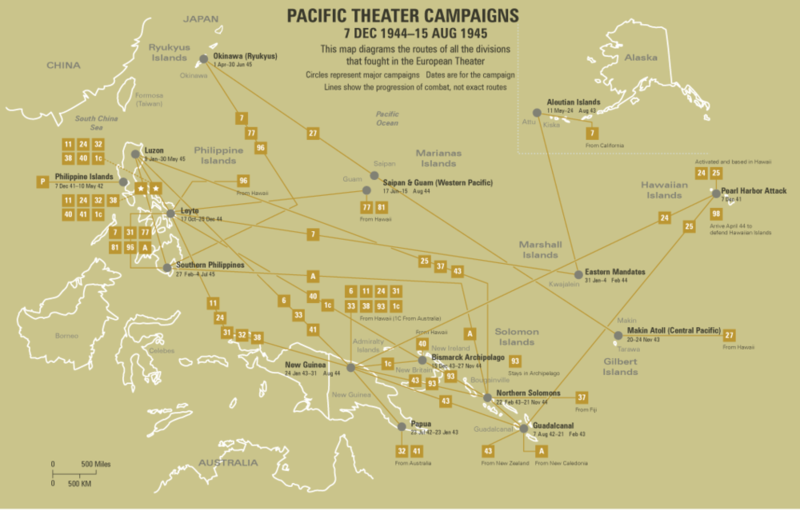 Enemy paratroops attempted to capture the Buri, Bayug, and San Pablo strips on 6 December. The 149th Infantry Regiment destroyed organized resistance, 11 December, and defended the strips until relieved, 4 January 1945. The Division landed in the San Narciso area in Southern Zambales Province, Luzon, 29 January 1945, without opposition. The San Marcelino airstrip was secured on the same day and the port facilities at Olongapo were captured on the 30th as well as Grande Island in Subic Bay after an amphibious landing. Driving west of Olongapo the 38th destroyed an intricate maze of enemy fortifications in Zig-Zag Pass. While elements landed at Mariveles on the southern tip of the peninsula, 15 February, other units pushed down the east coast road to Pilar and across the neck of land to Bagac along the route of the March of Death. Bataan Peninsula was secured on 21 February, although mopping-up activities remained. Elements moved to Corregidor, 24 February, to clear the enemy from the Rock. Units assaulted and captured Caballo Island, 27 March, Fort Drum on El Fraile Island, 13 April, and Carabao Island, 16 April. The 38th engaged enemy forces in the mountainous terrain between Fort Stotsenburg and Mount Pinatubo, 10 March. Elements pushed north from San Felipe to Palauig Bay and east from Botolan along the Capas Trail cutting the enemy's withdrawal route. The Division moved to the area east of Manila, 1 May, and attacked enemy forces behind the Shimbu Line. By 30 June effective enemy opposition had been broken. The 38th continued mopping up enemy remnants in the Marikina area of eastern Luzon until VJ-day.